About two years ago I had the best idea ever. I would boycott the companies flogging re-branded LED lights, and go straight to Ebay to get it cheaper from China. After all, it all comes out of the same factory right? The stuff I got for a bargain price lit everything up great….for about two weekends of camping. Then it mysteriously went dull and one by one the LED’s went out. I went back to headlamps for a year after that, until I met with Emiel and Claire of This Life Outside! They had a good outfit of Korr LED strip lighting. Incredibly bright stuff, a lot pricier than what you pay on Ebay, but the saying “the poor man pays twice” has never been truer! So I got myself a 25cm LED bar from Korr Lighting’s Website. 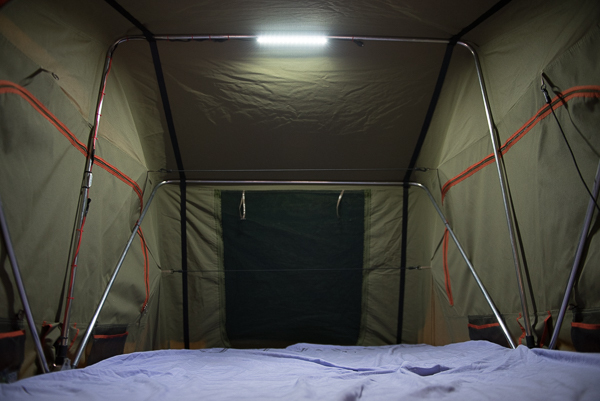 It claims 345 lumens and a power consumption of just 0.3 amps per hour. It is also IP68 waterproof, dust proof and dimmable. And it cost me about $32 at the time including postage. 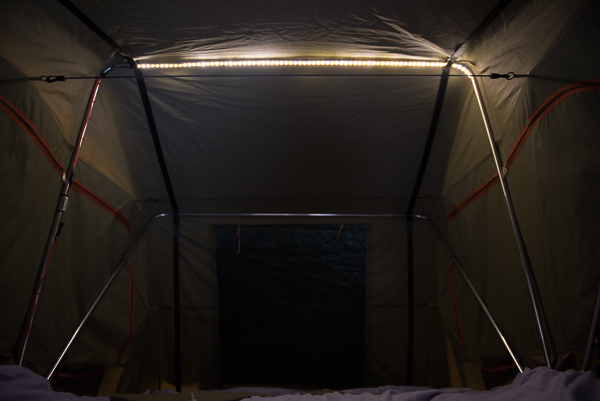 I’ve gone with the smallest LED bar they do in the solid strip type as that will fit perfectly along the bars in the top of my roof top tent. So this is what the light bar looks like. Korr’s name and the year is stamped on the actual circuit board under a layer of resin. To me that is a pretty good indicator that it’s not the same stuff everyone else sells – with some different branding on the box. In fact, Korr’s website says they design and manufacture of their lights. It has this waterproof plug on either end, so that you can daisy chain a few lights. I just want to hardwire mine, and right before I went to cut the female end off and solder it together, I realised that these plugs looked like a common 12 volt plug. Sure enough, I was able to cut the plug off an old charger and hardwire that instead. This meant I didn’t have to ruin my brand new light. I had to take a bit of a guess at the polarity, just for your reference: the positive is in the middle. Here’s an Ebay purchase that didn’t let me down. This little dimmer switch cost about $1.90 with free postage and was installed on my previous light. Not only can it dim, but it also has varying strobe speeds for my one man rave parties, and slow, pulsing, romantic modes – for getting in the mood and just enjoying my own company…. There’s the old stuff, 1.2 metres of flexible strip stuck across the middle. It used to be a bit brighter but for no apparent reason it dulled right down. There’s the new Korr light. Holy crap eh? That’s about 1/5th the size of the old light, and probably 3 times the light output! Both of these shots were taken using the same settings. ISO 2000, aperture of 2.8 and a shutter speed of 1/60. Pretty bloody good eh? I guess I was wrong about all LED lighting being the same, you just have to find the standout manufacturers that care about more than a big markup for quick dollars! I needed to meet you 3 years ago Matt and I mightn't have wasted so much time and money on cheap rubbish ones! You're right when you say some of the cheap stuff can be very good, but you do take a gamble. Sure is nice and bright! True Rob, they are different types of light. This was intended as more of a review of the Korr product than a comparison between the two, with the photos comparing them as just a visual indicator.